Hi there, I have been looking at your website with some interest and would like to make contact with you as I work in the Tourism Industry on the Fraser Coast and am interested to meet and network with people. 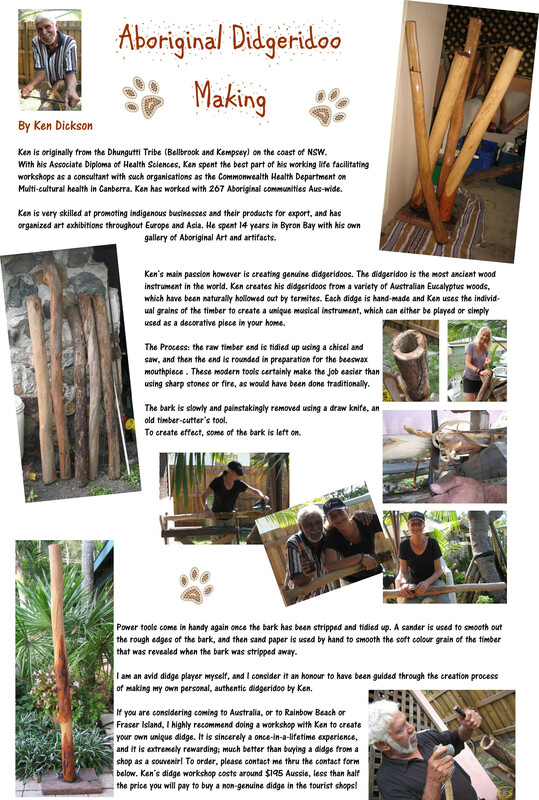 The Didgeridoo workshop sounds interesting too. has Kenny recorded his Didge playing? We are in short supply of original Indigenous music and when SFID has fund raising and awareness days it would be great to promote those who are supporting the cause. Gidday Kenny, Jen’s dad, Harold has made me a 21st Century Didge, it is a work of art. Now I have to learn the art of breathing and making sounds. I have been told to be very patient and practice everyday until I find the sweet spot. So you see, there are benefits of believing in and supporting Jen. Hey Kenny, I have a coupla sticks at my place , millions of termites and wouldn’t mind learning how to breathe proppa deadly like.